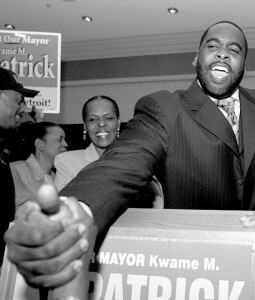 federal grand jury today indicted former Detroit Mayor Kwame Kilpatrick, his father and three former top aides on racketeering charges, accusing them of turning the mayor’s office into a criminal enterprise to enrich themselves, families and friends. …The 89-page indictment outlined four general areas of misconduct. It said the defendants extorted money from municipal contractors, state and non-profit donors and engaged in bribery and extortion involving other public contracts and investments. As a friend who hails from SE Michigan reminds me, the only people who are left in Detroit are those who can’t afford to leave. You can imagine what happens to the voter base when the situation gets that bad. Hence, they elect crooks like Kilpatrick and the city enters the final phase of its death spiral.